An international team of scientists—including several researchers from the U.S. Department of Energy's (DOE) Argonne National Laboratory—has discovered an anode battery material with superfast charging and stable operation over many thousands of cycles. 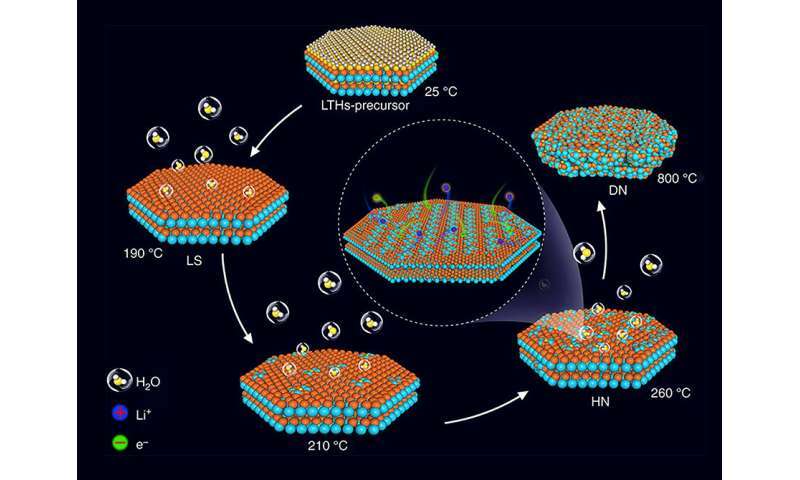 One of Argonne's latest contributions to innovative new materials for lithium-ion batteries is a water-bearing compound, "lithium titanate hydrate," developed in collaboration with researchers from Tsinghua University in Beijing and the Massachusetts Institute of Technology. This material, discussed in a recent Nature Communications article, could replace the graphite anode commonly used in lithium-ion batteries. Argonne Distinguished Fellow Khalil Amine, who also co-authored the study, noted that the heating to such a high temperature caused unwanted coarsening and clumping of the structure. The international team found that, by heating the anode material to a much lower temperature (less than 260°C), they could remove the water near the surface, but retain the water in the bulk of the material without coarsening and clumping of the structure. When the scientists tested the material in the laboratory, cycling stability improved and capacity degraded only slightly over 10,000 cycles. The material also charged very quickly—within less than two minutes—the team found. As noted by Jun Lu, "Most of the time, water is bad for non-aqueous lithium-ion batteries. But in this case, it can be downright good." If fast charging becomes a reality I think that the recharging stations will need to store grid power in batteries also. Otherwise the existing grid will not be able to handle the high peak loads that these stations would create. Tesla's superchargers are now getting practical for users with their increasing density and distribution. I bought a 2013 Model S P 85 with very few miles on it probably because they were not really practical back then for anything but short trips. "Otherwise the existing grid will not be able to handle the high peak loads that these stations would create." The utilities are ready for it.